Here are 4 free edgeless mouse software to wrap cursor around screen. By default, when you move mouse cursor to an edge (top, left, right, and bottom) of the desktop screen, it remains there. If you want to bypass this restriction, then all these free edgeless mouse software will help you surely. Using any of these software, you can wrap mouse cursor around the screen in just one or two clicks. When you will move the cursor to a particular edge, say left, then it won’t get stuck there. Instead, it will appear on the opposite edge of screen. So, mouse cursor can be moved freely. These software have some other interesting features also. 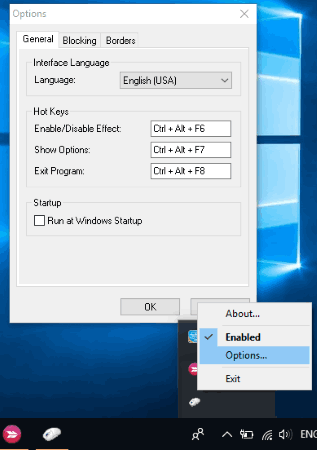 For example, you can create a hotkey to enable/disable the software, block a particular edge to stop mouse cursor crossing that edge and appear on the opposite edge, etc. Let’s check these free edgeless mouse software one by one. In my opinion, CursorUS is the best free edgeless mouse software on this list. Apart from wrapping mouse cursor around the desktop screen, it has some really interesting features that you won’t find in any other borderless mouse software. The first important feature is you can set a custom hotkey to enable/disable this software. 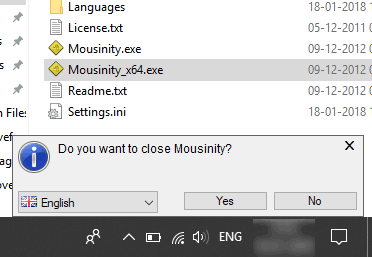 So, when you want to temporarily pause this software to use mouse cursor normally, you can press the hotkey and then press the same hotkey to activate this software again. Apart from that, it also helps to disable wrap feature for only top edge, left edge, bottom edge, or right edge of screen. By default, all the edges of the desktop screen are enabled but you can set which one you want to block to stop mouse cursor movement. Using this free edgeless mouse software is also pretty easy. After installation, you can run it and the software will start working. To customize options, you can right-click on its system tray icon, and then use “Options“. Edgeless is a very simple and useful software to wrap cursor around the screen. After installation, it sits in the system tray silently and does its work very well. When you will move the mouse cursor to the left edge of the screen, it will move mouse cursor to the right side and when you will move the mouse cursor to the bottom edge of screen, the cursor will appear on the top edge immediately and vice-versa. One unique feature also comes with this software. It has Wrap Options feature to wrap mouse cursor for left-right or top-bottom edges only. You can enable this option by right-clicking on its system tray and selecting “Wrap Options“. After that, you can enable only horizontal or vertical wrap for mouse cursor and then the software will work accordingly. I really like this edgeless mouse software because of its straightforward purpose. Note: The software hasn’t been updated for years but it works really well. In fact, I have tested this and all other software on Windows 10 PC. That also means these software are fully compatible with Windows 10. 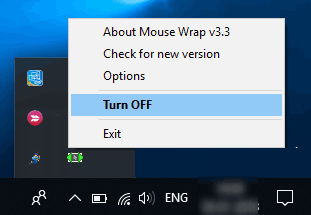 Mouse Wrap is another handy edgeless mouse software. Wrapping the mouse cursor around PC/laptop screen is pretty simple. In fact, you don’t have to do anything to wrap mouse cursor around screen except launching the software. So, simply install this software and run it. After that, move the mouse cursor to an edge of the screen and you will notice that mouse is appearing instantly on the opposite edge of the screen. This software also has one very good feature. You can activate/deactivate the software by right-clicking its system tray icon and toggling Turn On button. I wish it would have come with some hotkey support to enable/disable the software but you need to use right-click menu for this. Mousinity is the simplest edgeless mouse software on this entire list. It is a portable software and doesn’t come with any interface. Even it doesn’t come with any system tray icon. You can download its portable file, extract it, and then run the 32-bit or 64-bit application to activate it. Once the software is activated, it will start its work. When you will move mouse cursor to top, left, bottom, and right edge of screen, you will notice that it is moving mouse cursor to the opposite edge automatically. That’s how this software works. To deactivate or close this edgeless mouse software, you need to run the portable application file again. After that, it will show a pop up if you want to close the software. Press “Yes” button and then the software will close. These are some good free options to wrap mouse cursor around screen. All these edgeless mouse software are handy in serving the main purpose. Microsoft also provides a similar tool, named as “Mouse without borders“, but that tool works for multiple screens. If you want to wrap mouse cursor for a single screen, then these free software will help you. Among all these software, I prefer “CursorUS” software because it supports hotkey to activate/deactivate the software and brings the feature to block edges of the screen of your choice.